Currently, facility designers, developers and managers are looking for building service contractors whose competitive edge is focused on the deployment of integrated systems that streamline facility maintenance operations and enhance supplier/client collaborative relationships. In this new era, there is increasing pressure on cost reduction coupled with potential trade barriers, demand fluctuations and market uncertainties, sustainable compliance and the need for companies to create a more demand-responsive service strategy. Property owners have been forced to seek out service providers that will enable them to minimize risk, maximize quality and customer satisfaction and optimize revenue and profits. A new business model that emphasizes the triple bottom line, corporate responsibility, brand and image is of increasing interest. As a result, Building Service Contractors (BSCs) are viewing technology as the key weapon used to align facility management strategy with corporate strategy. The deployment of technology has become paramount to remaining competitive in this fierce industry. According to industry experts, an automated end-user software that tackles areas such as sustainability, risk management, efficiency/cost control, aging building and HR challenges would be the ideal solution to overcome the main challenges faced by property owners, facility managers and real estate developers. . Experts state that a complete solution should be flexible enough to allow companies to adapt to business change right on time. These applications must improve execution processes, internal/external cross-functional collaboration among trading partners, security and support government mandated compliance. All of these capabilities must assist organizations in increasing efficiency and productivity while reducing costs associated with the activities performed within the operations and maintenance area. The need to tackle these five fundamental challenges has compelled software providers to look for new alternatives that allow organizations to expedite reporting and automate highvolume decisions across environmental activities and link them with building operations to improve overall performance. It is a fact that technology exchange is the main driver for achieving performance. According to Gartner (an American information technology research and advisory firm) leaders in this industry are not skimping on investing time, money and effort in striving for technological advances to bring cutting-edge solutions to customers. Leaders see how real-time web-based technologies enable their organizations to synchronize building operation management activities at each stage. They are cognizant that technology gives them a huge bonus – the ability to collaborate with their business partners. Web-based technologies are being used to control core activities as well as the elements involved in facility change management, procurement and services to improve the flow of information across operations. On the contrary, laggards are still supporting low-end technology so it is common to see them using spreadsheets; phone/e-mail updates and in-house software tools. According to Gartner, the most prevalent B2B technologies used by building/facility managers to monitor all building maintenance activities are Electronic Data Interchange (EDI), Radio Frequency Identification (RFID), Vendor Managed Inventory (VMI), Customer Relationship Management (CRM), Business Process Automation (BPA), Sales and Operations Planning (S&OP), Failure Mode and Effects Analysis (FMEA), Supplier Relationship Management (SRM) and Supplier Portals. To increase visibility and collaboration, companies also use real-time routine feeds, FTP, XML feeds, e-mail attachments, mail, fax, e-marketplace, trade and consumer research and point-of-sale data which enable them to reduce costs, connect with partners and add value to their businesses. Sustainability also remains a challenge in the facility management industry.In order to countermeasure this issue, companies are searching for solutions that help them shift their focus from cost to the new business model. Have companies found the Holy Grail? Not yet, however, Corporate Social Responsibility Software (CSR) is seen as a promising technology that helps companies capitalize on the movement towards green and sustainable business practices. CSR enables organizations to collect, report and manage sustainable development information – CSR is moving from the fringes to the mainstream of corporate consciousness. I would say that within the next five years, these types of solutions won’t be anymore a nice-to-have tool instead it will be a must-have tool especially for corporations that claim to be environmentally committed. Why a must-have? Companies that take substantive voluntary steps towards sustainability are able to receive grants or tax exemptions for their efforts to give back to society! However, in corporate circles “being green” is still a buzzword (Check out my blog on – Is Green the new buzzword? Why Companies/Buildings are Pursuing LEED Certification) and some unscrupulous companies are claiming to be leaders in environmental initiatives to avoid interference in their businesses through taxation. As a result, governments have started to place some burden on compliance due to this lack of integrity. Currently, it may be possible for a company to treat a particular CSR-related activity as a bona fide business deduction, say, installation of solar panels in its office premises – which helps environment sustainability – against which it claims tax depreciation. So my question is – how can the government corroborate that this activity was indeed executed? Environmental Compliance Reporting – project reporting – is a must for companies, so be ready to provide an auditable record of green initiatives including targets, goals and milestones – it is here, where CSR applications come in handy. In order to address risk management, leaders are deploying Governance Risk and Compliance (GRC), and Records Management (RM) solutions, which enable them to comply with federal procedures and business practices. Such applications address the need to innovate, collaborate and achieve better information management. In order to have a strong compliance strategy, these organizations are implementing e-discovery, message archiving, ECM, and BPM systems to manage their content lifecycle. GRC and RM technologies enable organizations to mitigate risk by covering key aspects of compliance including role-based access, operational efficiencies, ERP roles, and user provisioning systems. Common GRC and RM solutions for this industry are those aimed at addressing disaster preparedness, workplace health and safety, security and data protection and work continuity. Business Processes Automation (BPA) is another technology deployed by leaders that allow users easy integration and more clarity concerning connectivity and support. BPA grants companies the ability to coordinate and synchronize end-to-end processes. 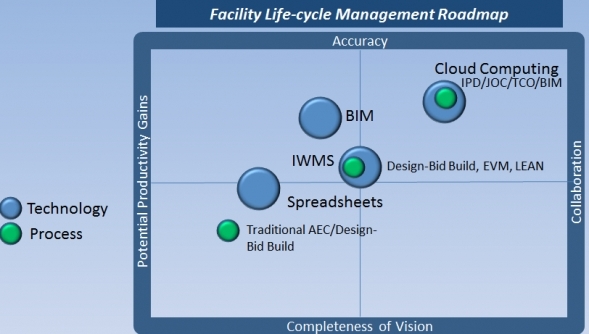 BPA applications include advanced FM automation systems such as CAFM-computer-aided facilities management/space planning/utilization, Building Information Modeling (BIM), Integrated Workplace Management Systems (IWMS), Earned Value Management (EVM), and LEAN. These applications enhance companies’ collaborative processes as integrated business processes, systems and people throughout the implementation of collaborative technologies support high levels of connectivity and provide information in real-time, so users can take a proactive approach that increases organizational efficiency and effectiveness. As I said, companies are still looking for the Holy Grail, but it won’t be long before we see the giants in the industry professing the benefits that these technologies have brought. I would say that large business applications are showing promise as top vendors take serious steps toward this market, but buyers expecting a full-fledged solution will have to be patient. It will be years before a complete product is offered without substantial configuration and implementation requirements. For now, if your company is one of those pledging to make its core operations more sustainable and help to minimize the impact on the planet; I assume you are deploying one of these killer technologies. I would like to invite you to enlighten us with your experience and let us know why you should be considered a leader in this competitive industry.